Since achieving Initial Operating Capability in July 1992, the E-3D Component has shared the NAEW&C mission with its sister Component at Geilenkirchen. From its Main Operating Base at Royal Air Force Waddington, the E-3D Component’s fleet of seven E-3D aircraft supports NATO missions and provides the United Kingdom with a national capability when necessary. The Component also comprises mission support, training, and engineering elements; maintains an expeditionary capability to respond from a state of high readiness to any operation around the world either as a NAEW&C Force asset, including as an element of the recently-formed NATO Response Force, or as a national contribution to any coalition. Under the day-to-day operational control of the NAEW&C Force Commander, the E-3D Component has made a major contribution to every National, NATO and Coalition Military Campaign since its formation and contributes 25% of the Force’s annual operational output. In controlling air combat assets in coordination with NE-3A aircraft, the E-3Ds have engaged in the conflicts in Bosnia, Kosovo, Iraq, Afghanistan, and more recently in supporting the air intediction over Libya. 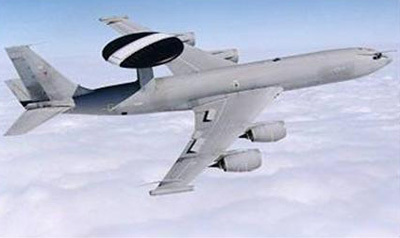 The E-3D variant of the AWACS is operated by a crew of 18, drawn from RAF and exchange personnel; it is configured to meet United Kingdom’s operational requirements, to maintain interoperability with Allied E-3 fleets and to maximise interchangeability with the E-3A. The most notable differences from the E-3A are its engine design and a refuelling probe.